NASHVILLE, Tenn.— Heaven’s Door Spirits, developed in partnership with legendary musician and artist, Bob Dylan, is celebrating the 50th anniversary of the release of Dylan’s iconic album, “Nashville Skyline” with the announcement of the Heaven’s Door Distillery and Center for the Arts in downtown Nashville, slated to open in Fall 2020. The new center will feature the Heaven’s Door craft distillery, complete with guided tours, a whiskey library, restaurant and a 360-seat live performance venue, all part of a renovation project to the 160-year-old Elm Street Church that will also display pieces of Dylan’s paintings and unique metalwork sculptures. Heaven’s Door is an ever-evolving portfolio of handcrafted whiskeys which are the perfect melding of art and craft, as each expression features Dylan’s unique ironwork sculptures. Heaven’s Door’s inaugural trilogy of craft whiskeys include a Tennessee Straight Bourbon (90 proof, $49.99 SRP), a Double Barrel Whiskey (100 proof, $49.99 SRP) and a Straight Rye Whiskey finished in French cigar barrels from Vosges, France (100 proof, $79.99 SRP). In 2018, Heaven’s Door also introduced a limited-release 10-Year Tennessee Straight Bourbon (100 proof, $129.99 SRP). Each of the brand’s three inaugural expressions has a direct tie to Tennessee — either through distillation, aging, barrel finishing or bottling. Tennessee boasts a long tradition of making great American whiskeys and its sweltering summers provides perfect conditions for barrel aging. The Heaven’s Door portfolio of whiskeys is available nationwide and online via ReserveBar.com. 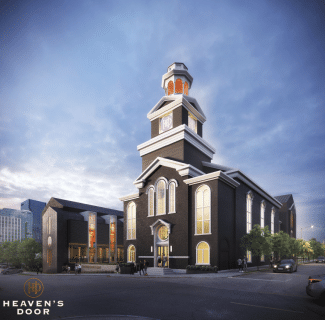 For more information about the brand and the brand’s future home in Music City, visit heavensdoor.com or engage with the brand on Instagram, Facebook or Twitter.